Two bedroom Villa Mai Tai is ideal for accommodating couples or small travelling parties. With a private pool, well-manicured lawn peppered with emerald foliage and bright, airy living spaces, the ambience here is cosy and relaxed - just what you want in a tropical retreat. 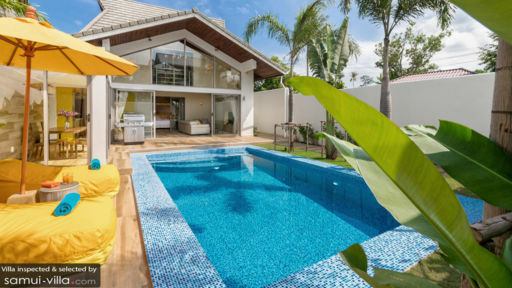 Set within the exclusive Ban Tai Estate, the villa enjoys ultimate privacy and a prime location just 300 metres away from the beachfront. Two bedroom sleeps four guests at Villa Mai Tai. Each is cosy and inviting with wood panel flooring, soft cream colours, silky sheers and pillowy beds. The bed runners, pillows, headboards and lamps are ornamental, helping to add bright pops of colours to the room. The spacious master bedroom is outfitted with a large walk in wardrobe and jacuzzi, and both bedrooms come equipped with private en suites. High walls surround the outdoor compound of Villa Mai Tai lend the home a sense of privacy. Swaying palms dot across a neatly manicured lawn, and a turquoise pool serves as the focal point outdoors. A wooden deck frames the pool, and comes outfitted with plump daybeds and patio umbrellas coloured in a bright, cheery shade of yellow. Sun-drenched and breezy, the grounds are ideal for soaking up the laidback tropical vibes, sunbathing, catching up on your summer reads or noshing on Thai-inspired nibbles. An outdoor screen projector lets you create your own poolside cinema experience. The living spaces at Villa Mai Tai wrap around the outdoor compound. The living room is large and lofty, with vaulted ceilings and glass walls that allow ample sunlight to permeate the interiors. Bi-folding doors provide easy access to the pool and garden, and the interiors are kept cool and comfortable with air conditioners. 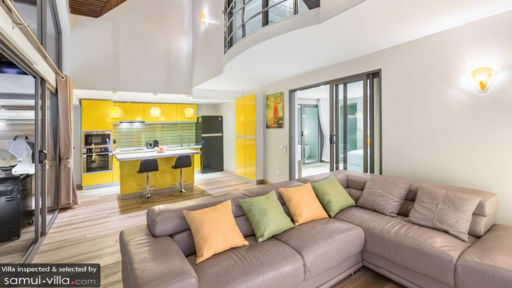 Wood panel flooring and neutral hues are design elements you’ll in all the common spaces, and the addition of vibrantly coloured artworks and furnishings in a sunny yellow hue help brighten the interiors. Villa Mai Tai is a full service property with housekeeping services, personal guest services, laundry service and security services. Families will appreciate the availability of kid-friendly amenities, like a baby cot, high chair and professional child minding services. The latter will be charged at additional cost. Other amenities available at additional cost include a daily breakfast service, personal chef services, in-villa massages, airport transfers, boat rental, vehicle rental and personal driver services. With Paradise Ban Tai Beach located just 300 metres from your doorstep, you’re never too far from the sun, sand and sea at Villa Mai Tai. A variety of restaurants are easily within reach; venues like Farmer Restaurant, Zenzibar Beach Bar, About Café and John’s Garden Restaurant and Bar set within close proximity (about a five to 15-minute drive from your villa). Take a 10-minute drive out to explore the lively walking street of Mae Nam, or soak up the vibes at the Mae Nam night market on Thursday evenings. Other notable attractions located around the area include the Big Buddha (a 30-minute drive), Fisherman’s Village Bophut (20-minute drive) and Maenam Chinese Temple (a 10-minute drive).